Wow, just wow! The Iron Knight surpassed my expectations for being the final book in the series. The whole book was so beautiful written from the front page to the ending word. I am so very sad to know that this is the end for our friends we grew to love in Never Never. I wanted to read it again and again so I could deny myself that thought. I found myself crying in the end of the book it was just so astonishing and memorable. You will want to read the whole series again to have the feeling of these wonderful characters always in your mind. This book is taken from former Prince Ash's POV and I must say I was not sure how I would like it because up until now I was loving that Meghan was telling the story but it was really fun and refreshing being told from someone who you find has lost so much and yet has so much to gain. In this book we find out more about Ash's life before he meet Meghan, and also there is a new friend we meet along there journey to where Ash need to go to earn a soul so he can be with his true love Meghan forever. Ash will be put through many test and trials though-out the books which will be the true test for his love for Meghan. I love that fact that someone comes back into the story, someone who you never would think would. It is great to hear it from Ash's POV and feel how he feels about this someone is has missed for so long... but what about Puck? Well, Good ol' Puck is still there and helping along side Ash even until there very end. Although it leaves me feeling like will Puck ever find love as Ash has? 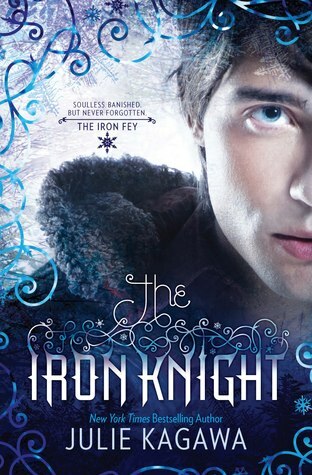 I still had a few questions after I finished reading but for the most part I totally loved The Iron Knight. Julie Kagawa has done it again. I could never do a prefect review for this book or any of her books to do Julie's written work justice but let me tell you one thing - The Iron Knight as the rest of the series is by far the best books I have read in a very long time and I would so recommend them to anyone would wants to get lost in a world of fairies, monsters, magic, battles, mythical creatures, but most of all LOVE! Now I'm so exited to read this book. I loved Ash in the other books and for me it's a bonus that this book will is written from his POV. Thanks for posting your review.